COMMENTS:        This trigger occurred at longitude,latitude = 107.25,22.50 [deg]. COMMENTS:       NOTE: This SPIACS event is temporally(1.0<100sec) coincident with the FERMI_GBM event (trignum=493061461). At 17:30:58 on August 16, 2016 Fermi-LAT detected high-energy emission from GRB 160816A, which was also detected by Fermi-GBM (trigger 493061460 / 160816730). with an error radius of 0.13 deg (90% containment, statistical error only). This was 35 deg from the LAT boresight at the time of the trigger and triggered an autonomous repoint of the spacecraft. The data from the Fermi-LAT show a significant increase in the event rate that is spatially and temporally correlated with the trigger with high significance. The highest-energy photon is a 9.5 GeV event which is observed ~1100 seconds after the GBM trigger. A Swift ToO request has been approved for this burst. The Fermi-LAT point of contact for this burst is Francesco Longo (francesco.longo@trieste.infn.it). 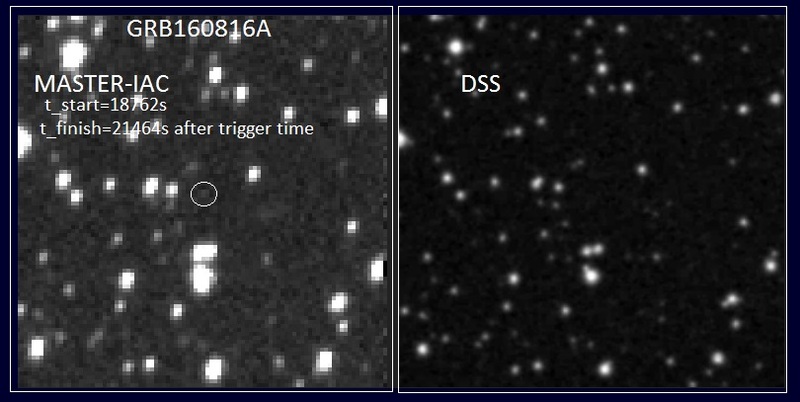 "At 17:30:57.97 UT on 16 August 2016, the Fermi Gamma-Ray Burst Monitor triggered and located GRB 160816730A (trigger 493061461 / 160816730), which was also detected by the LAT (Racusin et al., 2016, GCN 19802). The on-ground calculated location, using the GBM trigger data, is consistent with LAT position. The trigger resulted in an Autonomous Repoint Request (ARR) by the GBM Flight Software owing to the high peak flux of the GRB. This ARR was accepted and the spacecraft slewed to the GBM in-flight location. The initial angle from the Fermi LAT boresight to the GBM ground location is 34 degrees. The GBM light curve consists of multiple peaks with a duration (T90) of about 11.0 s (50-300 keV). The time-averaged spectrum from T0-0 s to T0+13.8 s is best fit by a power law function with an exponential high-energy cutoff. The power law index is -0.73 +/- 0.02 and the cutoff energy, parameterized as Epeak, is 235 +/- 4.29 keV. A Band function fits the spectrum equally well with Epeak = 224 +/- 5.46 keV, alpha = -0.71 +/- 0.02 and beta = -2.97 +/- 0.19. The event fluence (10-1000 keV) in this time interval is (3.467 +/- 0.037)E-05 erg/cm^2. The 1-sec peak photon flux measured starting from T0+7.6 s in the 10-1000 keV band is 39.1 +/- 0.4 ph/s/cm^2. MASTER-IAC robotic telescope (MASTER-Net: http://observ.pereplet.ru) located in Teide observatory was pointed to the Fermi LAT GRB160816A 924 sec after notice time at 2016-08-16 22:57:12 UT (NOTICE_DATE:Tue 16 Aug 16 22:42:36 UT) and 19665 sec after the trigger time(the delay in 15min was from the inspection of previous FermiGBM alert and late notice time). On our first 180s exposures we haven`t found optical transient within LAT error-box (RA, Dec = 322.45, 37.16 (J2000) r=0.13). There is a disc galaxy (unknown in NED) inside LAT error-box at the position 21h 29m 23.16s +37d 05m 54.9s - possible host galaxy for GRB. The 5-sigma upper limit has been about 19.7 mag The message may be cited. Swift-XRT has performed follow-up observations of the Fermi/LAT-detected burst GRB 160816A (Racusin et al. GCN Circ. 19802), collecting 1.6 ks of Photon Counting (PC) mode data between T0+25.2 ks and T0+31.8 ks. with an uncertainty of 3.8 arcsec (radius, 90% confidence). This position is 3.8 arcmin from the Fermi/LAT position. The light curve is consistent with a constant source of mean count rate 7.8e-02 ct/sec. A power-law fit gives an index of 1.5 (+1.8, -1.7). A spectrum formed from the PC mode data can be fitted with an absorbed power-law with a photon spectral index of 1.7 (+0.6, -0.3). The best-fitting absorption column is 2.97 (+3.55, -0.16) x 10^21 cm^-2, consistent with the Galactic value of 2.8 x 10^21 cm^-2 (Willingale et al. 2013). The counts to observed (unabsorbed) 0.3-10 keV flux conversion factor deduced from this spectrum is 4.5 x 10^-11 (5.8 x 10^-11) erg cm^-2 count^-1. The results of the XRT-team automatic analysis of the likely afterglow are at http://www.swift.ac.uk/ToO_GRBs/00020685/index_1.php. The results of the full analysis of the XRT observations are available at http://www.swift.ac.uk/ToO_GRBs/00020685. with an uncertainty of 1.0 arcsec and r~21.0 +- 0.2 mag (AB). We observed the field of the Fermi GRB 160816A (Mailyan, et al., GCN 19804; Racusin et al. 19802) with the Reionization and Transients Infrared Camera (RATIR; www.ratir.org) on the 1.5m Harold Johnson Telescope at the Observatorio Astron=F3mico Nacional on Sierra San Pedro M=E1rtir from 2017-08-17 06:15 to 07:44 UTC (12.8 to 14.2 hours after the GBM trigger), obtaining a total of 0.71 hours exposure in the r and i bands and 0.30 hours exposure in the Z, Y, J, and H bands. These magnitudes are in the AB system and are not corrected for Galactic extinction in the direction of the GRB. The source position is RA,Dec(J2000)=3D21:29:38.549,+37:07:58.79 with an uncertainty of 0.5 arcs= ec. Our position is consistent with the candidate reported from Guidorzi, et al. (GCN 19808). The long-duration, very intense, GRB 160816A (Fermi LAT detection: Racusin et al., GCN Circ. 19802; Fermi GBM observation: Mailyan and Meegan, GCN Circ. 19804) triggered Konus-Wind at T0=63061.653 s UT (17:31:01.653). The burst light curve shows a multipeaked structure started at ~T0 with a total duration of ~14 s. The emission is seen up to 3 MeV. As observed by Konus-Wind, the burst had a fluence of 3.16(-0.10,+0.11)x10^-5 erg/cm2, and a 64-ms peak flux, measured from T0+8.032 s, of 1.63(-0.16,+0.16)x10^-5 erg/cm2/s (both in the 20 keV - 10 MeV energy range). GRB 160816A has been observed by Konus-Wind (GCN 19810), Fermi GBM and LAT (GCN 19804, GCN 19802), and Mars Odyssey-HEND, so far. We have triangulated it to a preliminary annulus centered at RA, Dec (2000)=63.3328, 24.0531 degrees, with radius 83.8027 +/- 0.1087 degrees (3 sigma). The center line of the annulus passes 0.0086 degrees from the Swift XRT source (GCN 19806), supporting the conclusion that this source is the GRB afterglow. A map has been posted at ssl.berkeley.edu/ipn3/160816A. The Swift/UVOT began settled observations of the field of the Fermi/LAT- detected GRB 160816A 25222 s after the LAT trigger (Racusin et al. GCN Circ. 19802). A source consistent with the XRT position (Kennea et al. GCN Circ. 19806) and the LCOGT Faulkes Telescope North position (Guidorzi et al., GCN Circ. 19808) is detected in the initial UVOT exposures at the same position as reported by RATIR (Troja et al, GCN. Circ. 19809). The magnitudes in the table are not corrected for the Galactic extinction due to the reddening of E(B-V) = 0.25 in the direction of the burst (Schlegel et al. 1998). We observed the field of GRB 160816A detected by Fermi (Racusin et al., GCN Circ. 19802) with the iTelescope.Net (http://www.itelescope.net) T7 (17" Plane Wave) telescope located at the AstroCamp Observatory (Nerpio, Spain). 15 images of 60 sec exposures were taken in the R filter starting from August 16 22:50:57 (UT) about 5.9 hours after the trigger and stopped on August 16 23:26:36 (UT). We do not detect the optical afterglow both in the individual images and the stacked image at the X-ray afterglow position (Kennea et al., GCN Circ. 19806). The estimated five sigma upper limit of the combined image (total exposure of 900 sec) is ~18.3 using the USNO-B1 catalog. The 2-m Liverpool Telescope observed GRB 160816A from August 17, 23:29 UT to August 18, 02:44 UT with a total net exposure of 600 s in both SDSS-R and SDSS-I filters. The optical afterglow candidate (Guidorzi et al. GCN 19808; Troja et al. GCN 19809; Kuin et al. GCN 19815) has faded to r=21.8 +- 0.2 mag at 1.3 days post burst, compatibly with an average power-law decay index alpha~1. 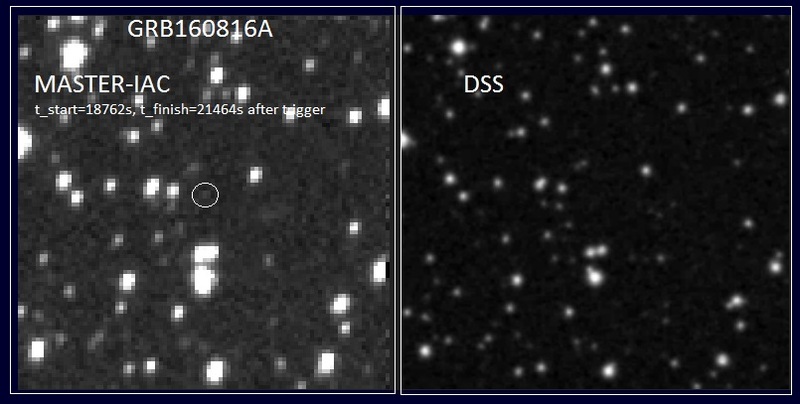 We observed the field of GRB 160816A (Mailyan, et al., GCN 19804; Racusin, et al., GCN 19802) with the Reionization and Transients Infrared Camera (RATIR; www.ratir.org) on the 1.5m Harold Johnson Telescope at the Observatorio Astron=F3mico Nacional on Sierra San Pedro M=E1rtir from 2016/08 18.17 to 2016/08 18.47 UTC (1.44 to 1.72 days after the GBM trigger), obtaining a total of 2.47 hours exposure in the r and i bands and 1.03 hours exposure in the Z, Y, J, and H bands. The source intensity decreased significantly between our two epochs, corresponding to fading with power-law index alpha~-1.3 referenced to the burst trigger. This confirms that the candidate reported by Guidorzi, et al. (GCN 19808) and Troja et al. (GCN 19809) is the GRB afterglow. Deep imaging of the GRB location reveals additional optical sources within the XRT localization (Kennea et al., GCN 19806), however none of them have faded. MASTER II robotic telescope (MASTER-Net: http://observ.pereplet.ru) located in IAC was pointed to the GRB160816.73 24 sec after notice time and 18726 sec after trigger time at 2016-08-16 22:43:04 UT. (We corrected start exposition time which published in previouse MASTER circular (Lipunov et al., GCN 19805). We reducted coadded images and found OT. m_OT=20.5 (+0.5 -0.2) at mean exposition time 2016-08-16 23:05:53, 20095 sec (5.58 hours) after GBM trigger time. T_start =18762sec, T_end=21464 after trigger. The total exposition = 1800 sec. We observed the field of the Fermi GRB 160816A (Mailyan, et al., GCN 19804) with the Reionization and Transients Infrared Camera (RATIR; www.ratir.org) on the 1.5m Harold Johnson Telescope at the Observatorio Astron=F3mico Nacional on Sierra San Pedro M=E1rtir from 2016/08 19.16 to 2016/08 19.50 UTC (2.43 to 2.77 days after the GBM trigger), obtaining a total of 5.58 hours exposure in the r and i bands and 4.56 hours exposure in the Z and J bands. We tank the staff of the Observatorio Astron=F3mico Nacional in San Pedro M=E1rtir. We observed the Fermi/LAT GRB 160816A (Racusin et al., GCN 19802) with the AMI Large Array at 15 GHz on 2016 Aug 18.02, Aug 19.06, and Sep 03.02 (UT) as part of the 4pisky program. We detect a possible radio afterglow (consistent with the XRT location; Kennea et al., GCN 19806) in the second epoch with a peak flux density of 129+/-32 uJy, and 3sigma upper limits of 111 uJy and 168 uJy in the first and third epochs respectively.